If you believe pharmaceutical corporations hold the health of the general public in high regard, it’s time to reconsider. The industry is filled with examples of wrongful death, extortion, fraud, corruption, obstruction of justice, embezzlement, fake journals, harassment and hit lists that would make even the most hardened Mafia godfather blush. 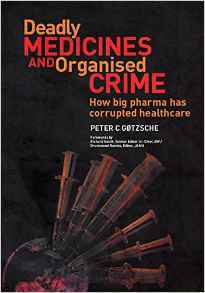 Big Pharma has been fined billions by the U.S. Department of Justice, but these enormous fines don’t curb the corruption, it’s just looked upon as “the cost of doing business,” similar to paying the utilities. In more than 50 years of pediatric practice, I’ve never seen a single legitimate medical reason for foreskin amputation – never, not one! I think we have been lied to by a lot of people in the medical business, and we politely accepted what they said as face. Robert David Steele: Truth and Reconciliation in the USA? 2013: Does the US play a “Shell Game” with its Georgian bioweapons labs? Did the Pentagon’s Manipulation of Hurricane Florence Fail or Succeed? Dementia has skyrocketed since 1990: Fluoride Connection?